Adirondack Photography Institute is expanding our offerings for our veteran workshop attendees and new participants alike, guiding them to autumn locations we haven’t toured before with ADKPI . For this workshop we’ll base ourselves out of two locations: the villages of Long Lake and Saranac Lake. The first couple of days will be spent photographing new locales around Long Lake. We’ll then work our way towards Saranac Lake, for a different look and feel of autumn in the Adirondacks, spending the next three days photographing a wide variety of lakes and landscapes. The central Adirondack lake country is carpeted with lush forests sprinkled with numerous lakes and ponds, including Long Lake. The autumn forests explode with color; yellows, oranges and reds are mixed with aquamarine, tangerine, cherry, peach and other fanciful colors. Shorelines are rimmed with maple, beech, birch and cherry, their colors creating impressionistic paintings on the waters. With the changing of the seasons, mists rise from the waters most mornings, softening the rich colors to beautiful pastels. 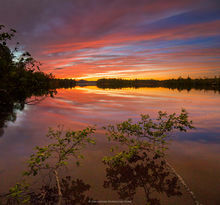 The gentle, rolling terrain of the central lake country continues up into the Saranac Lakes and St. Regis Wilderness chains of lakes and ponds. Here the mix of deciduous trees and evergreens drape whole mountainsides with tapestries of bold color — some of the most dazzling fall foliage in the North Country. 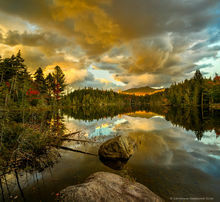 The St Regis Wilderness offers quinntissential and peaceful views of Adirondack waters. The possibilities for creative photography here are unbounded. Mark Bowie, Adirondack Life contributor and author of three photography books on the Adirondacks, has worked extensively in both areas. He'll be joined by Adirondack native Jonathan Esper , whose images have appeared in Adirondack Life, Adirondack Explorer, and Adirondac magazines. They will guide you to wild shores, rivers, streams, waterfalls, intimate backwoods and boreal bogs. You’ll also likely encounter wildlife; the area is home to numerous songbirds, ducks, loons, great blue herons, and mammals, including beavers, otters, chipmunks, squirrels, coyote, fox, bear and moose. Our emphasis will be on shooting, shooting, shooting! We will typically shoot for several hours around sunrise and sunset each day, and throughout much of the days as favorable lighting conditions present themselves. We will also intersperse our photography with indoor instruction sessions presented by Mark and Johnathan. 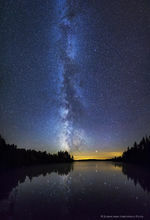 Weather permitting, we'll also photograph the moody blues of twilight and the magnificent Adirondack night sky. Join two of the most prolific and approachable photographers shooting in the region today as they guide you to spectacular backwoods locations and help elevate your fall photography to artistic excellence!